Toronto led cities in both Canada and the United States in the tech jobs number created within 2012 and 2017, outpacing popular tech hubs like the San Francisco Bay Area, Recent study shows. 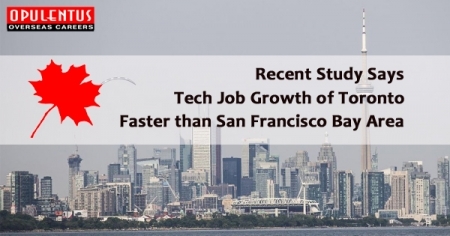 More than 82,000 tech jobs were generated in Toronto while the five-year period, approximately 4,300 more than the tech jobs number produced in the San Francisco Bay Area through this time frame. Toronto attached 28,900 tech jobs in 2017 solely, an improvement of 13.6 percent over the prior year presenting it the quickest growing tech market in North America for the following year in a row. Overall, Toronto put in fourth place out of the 50 North American towns that compose the 2018 Scoring Report of Tech Talent provided by C.B.R.E Canada, a division of the Fortune 500 C.B.R.E Group headquartered in Los Angeles. The Tech Talent Scorecard is defined based on 13 unique metrics, along with tech talent supply, increase, concentration, cost, finished tech degrees, the outlook of the industry for tech job increase, and market outlook for both cost growth of office and apartment rent. “Toronto remains to outpace other markets of North America, having added extra tech jobs in 2017 than the San Francisco Bay Area, Seattle, and Washington, D.C. combined,” stated Paul Morassutti, C.B.R.E Executive Managing Director Canada. Ottawa, the national capital of Canada and address to global tech powerhouse Shopify, put 13th overall but took top place in the category of “Momentum Market,” which looks at the market of tech talent showing the fastest growth in North America. The growth of Tech employment in Ottawa was 15.2 percent in 2016 and 2017, 3.5 percent greater than second-place Los Angeles, which had 11.7 percent increase. The study says Ottawa is home to higher than 1,700 technology companies and engages more than 70,000 technology employees, which expresses 11.2 percent of entire jobs in the city. San Francisco in the second place, with 9.8 percent. The C.B.R.E states this concentration of technology talent in Ottawa is higher than three times the U.S. country average of 3.5 percent.